EXPERIENCE COMFORT THAT'S PATENTED VISIT US AT MEDTRADE BOOTH #1925 The Patent-Pending Twilight Technology includes an extra motor that provides a tilting motion, cradling your body and offering more positioning than any other recliner on the market. WHAT IS TWILIGHT TECHNOLOGY? 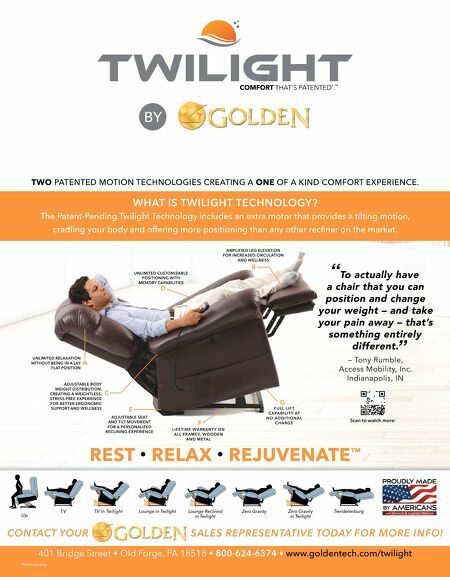 REST • RELAX • REJUVENATE ™ %ULGJH6WUHHWŘ2OG)RUJH3$Ř800-624-6374 Řwww.goldentech.com/twilight TWO PATENTED MOTION TECHNOLOGIES CREATING A ONE OF A KIND COMFORT EXPERIENCE. *Patent pending TV in Twilight Lounge Reclined in Twilight Zero Gravity T V Lounge in Twilight Zero Gravity in Twilight Trendelenburg U p BY COMFORT THAT'S PATENTED * . TM A C E F G D B A UNLIMITED RELAXATION WITHOUT BEING IN A LAY FLAT POSITION ADJUSTABLE BODY WEIGHT DISTRIBUTION, CREATING A WEIGHTLESS, STRESS-FREE EXPERIENCE FOR BETTER ERGONOMIC SUPPORT AND WELLNESS ADJUSTABLE SEAT AND TILT MOVEMENT FOR A PERSONALIZED RECLINING EXPERIENCE F U L L L I F T CA PA B I L I TY AT N O A D D I T I O N A L C H A R G E B AMPLIFIED LEG ELEVATION FOR INCREASED CIRCULATION AND WELLNESS UNLIMITED CUSTOMIZABLE POSITIONING WITH MEMORY CAPABILITIES LIFETIME WARRANTY ON ALL FRAMES, WOODEN AND METAL Scan to watch more: CONTACT YOUR SALES REPRESENTATIVE TODAY FOR MORE INFO! 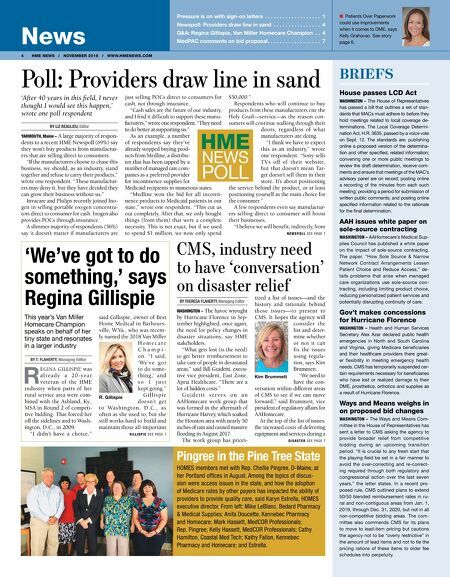 CONTACT YOUR SALES REPRESENTATIVE TODAY FOR MORE INFO! CONTACT YOUR SALES REPRESENTATIVE TODAY FOR MORE INFO! CONTACT YOUR SALES REPRESENTATIVE TODAY FOR MORE INFO! CONTACT YOUR SALES REPRESENTATIVE TODAY FOR MORE INFO! CONTACT YOUR SALES REPRESENTATIVE TODAY FOR MORE INFO! CONTACT YOUR SALES REPRESENTATIVE TODAY FOR MORE INFO! CONTACT YOUR SALES REPRESENTATIVE TODAY FOR MORE INFO! CONTACT YOUR SALES REPRESENTATIVE TODAY FOR MORE INFO! CONTACT YOUR SALES REPRESENTATIVE TODAY FOR MORE INFO! CONTACT YOUR SALES REPRESENTATIVE TODAY FOR MORE INFO! CONTACT YOUR SALES REPRESENTATIVE TODAY FOR MORE INFO! CONTACT YOUR SALES REPRESENTATIVE TODAY FOR MORE INFO! CONTACT YOUR SALES REPRESENTATIVE TODAY FOR MORE INFO! CONTACT YOUR SALES REPRESENTATIVE TODAY FOR MORE INFO! CONTACT YOUR SALES REPRESENTATIVE TODAY FOR MORE INFO! CONTACT YOUR SALES REPRESENTATIVE TODAY FOR MORE INFO! CONTACT YOUR SALES REPRESENTATIVE TODAY FOR MORE INFO! CONTACT YOUR SALES REPRESENTATIVE TODAY FOR MORE INFO! CONTACT YOUR SALES REPRESENTATIVE TODAY FOR MORE INFO! CONTACT YOUR SALES REPRESENTATIVE TODAY FOR MORE INFO! CONTACT YOUR SALES REPRESENTATIVE TODAY FOR MORE INFO! CONTACT YOUR SALES REPRESENTATIVE TODAY FOR MORE INFO! CONTACT YOUR SALES REPRESENTATIVE TODAY FOR MORE INFO! CONTACT YOUR SALES REPRESENTATIVE TODAY FOR MORE INFO! CONTACT YOUR SALES REPRESENTATIVE TODAY FOR MORE INFO! CONTACT YOUR SALES REPRESENTATIVE TODAY FOR MORE INFO! CONTACT YOUR SALES REPRESENTATIVE TODAY FOR MORE INFO! CONTACT YOUR SALES REPRESENTATIVE TODAY FOR MORE INFO! CONTACT YOUR SALES REPRESENTATIVE TODAY FOR MORE INFO! CONTACT YOUR SALES REPRESENTATIVE TODAY FOR MORE INFO! CONTACT YOUR SALES REPRESENTATIVE TODAY FOR MORE INFO! CONTACT YOUR SALES REPRESENTATIVE TODAY FOR MORE INFO! CONTACT YOUR SALES REPRESENTATIVE TODAY FOR MORE INFO! CONTACT YOUR SALES REPRESENTATIVE TODAY FOR MORE INFO! CONTACT YOUR SALES REPRESENTATIVE TODAY FOR MORE INFO!